Organizations are basic to youth development practice and programming. This is their home, their host, their context. Most youth work and youth programs in the United States exist within and because they receive care and support from their host organization. Scholarly attention on youth organizations the structure, ethos, culture, social organization, and processes of these are basic and necessary to fully support healthy youth development practices, programs, and opportunities. Without organizations, these would be homeless. To get more and better healthy youth development programs requires housing them in supportive organizations. Some organizations are fully or somewhat effective, in part because they have responded well to the young people they serve that is, they have met the wants and needs of their everyday changing clients, as well as the bureaucratic and funding worlds in which they are enmeshed. It is necessary to know about and understand what makes a good organizational host and how such organizations can be made and sustained. 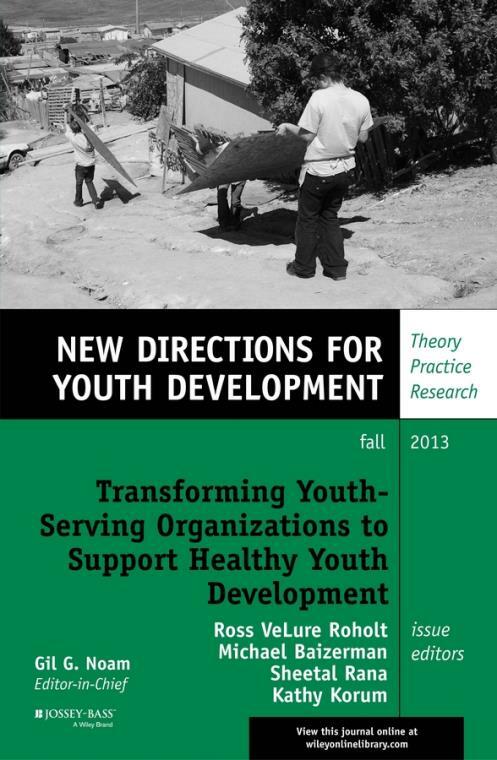 This volume ofNew Directions for Youth Development is organized around the different organizational change efforts at one municipal youth–serving organization to better support healthy youth development systemwide. Each article describes the different strategies and tactics used to support organizational transformation. This article discusses how questions about organization change and development are directly connected to positive youth development efforts and how they provide a beginning research agenda on youth organizations. initiative faced and lessons learned from it. This article describes the collaborative research strategy used by Youth Studies, University of Minnesota faculty and students, and Saint Paul (municipal) Parks and Recreation over the past five years as part of the effort to enhance Saint Paul Parks and Recreation s youth services and programs. This article analyzes youth advisory structures, their formal structural arrangements, the process used by each, and the practice of working with young people using certain processes within different types of formal organizational structures. This article describes partnership approaches that encourage new ways of thinking about or working with other organizations that foster a space for negotiation and focus on meeting youth and community needs. This article describes an organization s experience of a collaborative approach to funding Saint Paul Parks and Recreation to help the agency continue and expand its innovations in youth work and to diffuse specific strategies into other recreation centers. This article brings together all lessons learned over our six years of work with Saint Paul Parks and Recreation and suggests the scientific truths, that is, and practice utility of these.